On Friday I shared some ideas to do with a cardboard box and one of them was a slide on the stairs. 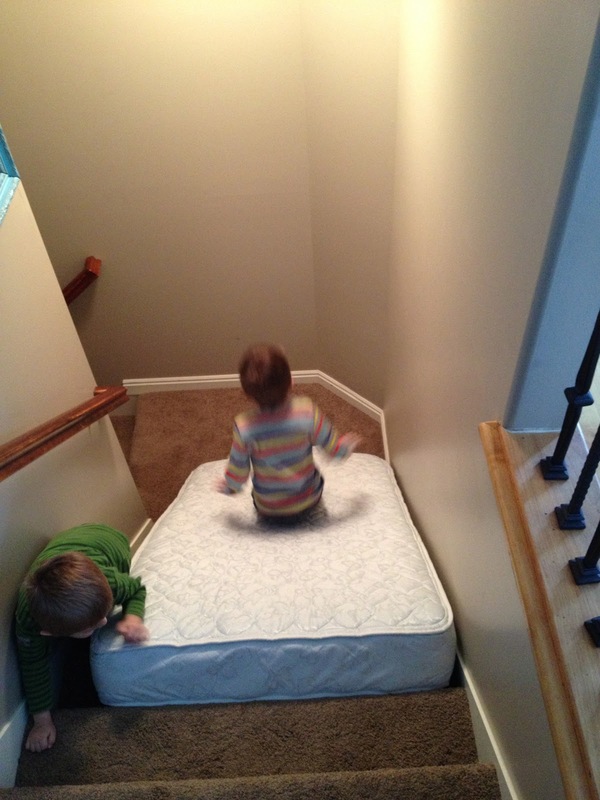 Well, one of you awesome readers mentioned that you used to do that with a foam mattress on the stairs. And there was just enough room for them to get back up the stairs. So maybe you don't have a mattress you want to put on the stairs or maybe this is a bit wild for you. One of the best secrets I've learned from my mom is to make "races" or "obstacle courses" for my kids. On those days when they just need to get some energy out this is perfect. For Rex I might say, "For this race I need you to run upstairs, do a somersault on my bed, jump on your bed three times, come downstairs, and then get in the recliner and shout 'My mom rocks!'" Then he wants another challenge. I can even sneak in occasional chores for them to do within the race. Both of my boys will keep at that for almost a half an hour and they especially like to be timed. I know it all sounds silly, but they love it. So, here's a short, little video of them first trying out the mattress. 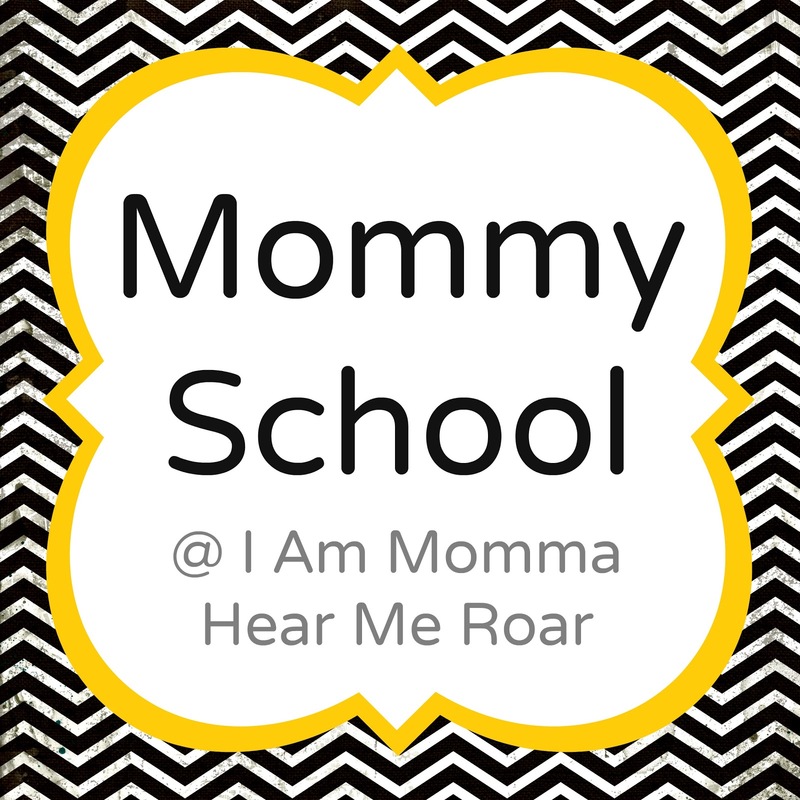 What do you do when your kids need to get some energy out? I'd love to hear your ideas, too! Thanks for stopping by. This looks like so much fun! Makes me wish we had stairs at our place. :-) At this point the best way we have to get our 3 yr old son to discharge excess energy is to have him wrestle with my husband. He has sensory processing disorder which for him means he needs to "wake up" receptors in his joints that communicate to the brain how the body is positioned within the space around you. If he is starting to stumble around a lot or he is acting hyper it tells me he needs to have these receptors stimulated. One way of doing this is with "crashing" activities, so we bought a large bean bag on Amazon and my husband will swing and throw Eli onto it repeatedly. Or if it's just me and the boy at home Eli can climb up on a chair and jump onto the bean bag in all sorts of creative ways. A lot of fun is had and afterwards he is a lot calmer. I have an overactive son and when he has too much energy and we can't physically run around to get it out, he likes a big squeeze. I just hug him as hard as I can and he loves it. It helps calm him down and it's easy to do anytime, anywhere. My 1 year old grandson didn't learn to climb stairs when he was crawling, so now that he walks he is afraid of stairs. 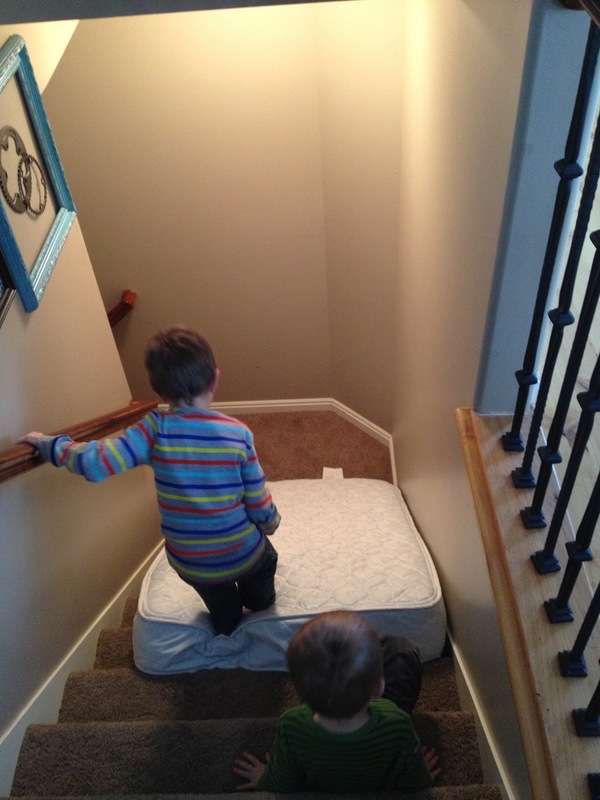 This last weekend, a foam mattress was brought up stairs and the whole family slide down the stairs on the mattress, the mattress and it's rider went down the stairs together. Then they had to climb back up the stairs daddy dragging the mattress with him while the baby and his big brother had to crawl back up by themselves. By the end of 2 hours, the grandbaby had it all figured out and is no longer afraid of stairs. 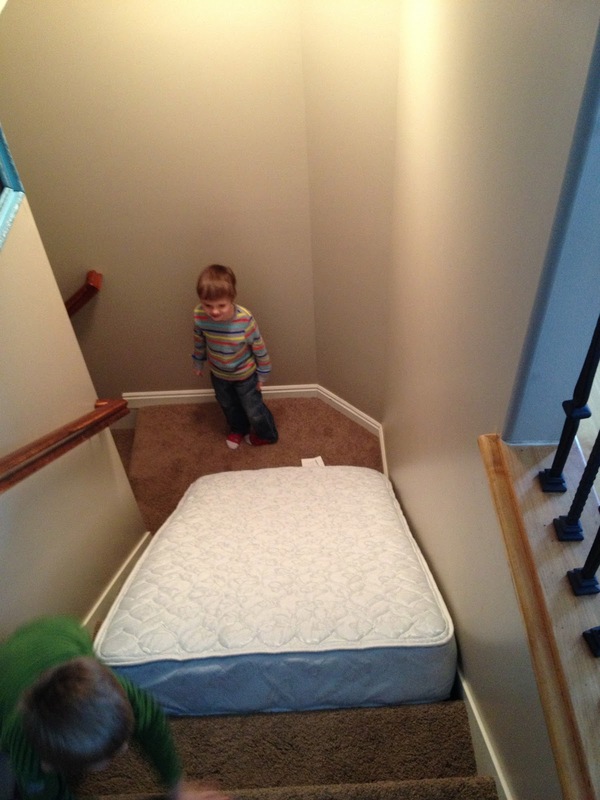 I am so glad to have that kid "stair safe". Love these ideas! We used to be able to get our younger sisters to do anything if we promised to time them. :) I look forward to doing this when my little guy is a little older. That looks like so much fun. it reminds me of the scene in Princess Diaries 2 where they little girls all go mattress surfing at the princess' hen's night. Shame I don't have stairs. Yay!! 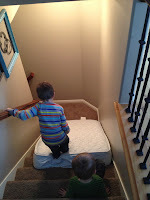 glad they loved it (and a little amazed that you read my comment, I often wonder if comments just disappear into blogland).... our poor guest bed almost needs a new mattress topper because I have used this little sanity saver so often over the last couple years! Winter is long here in Alberta Canada! That's too funny! 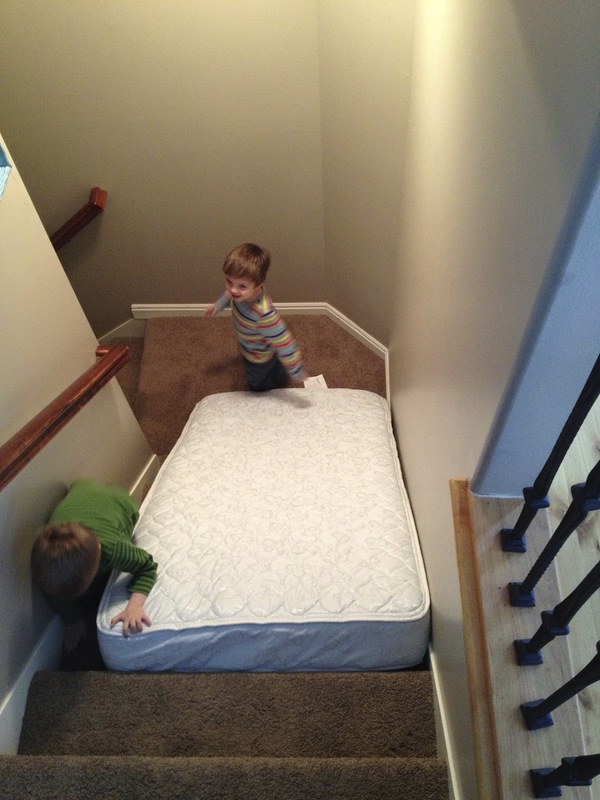 My parents were very against us sliding on the stairs, so when they weren't there we would do it. One day my sister came up with the "great" idea of using skis down the stairs. That was pretty painful (of course, as the younger sister, I had to try it first, so I was the one who got hurt!). Haha. Thanks for the good memories. Hey Girl, you should check out some Parkour videos online. We have four boys and we've loved letting them watch a video and then watching them try it out; jumps, vaults, landings, etc. Parks, parking lots, along the road, in the yard, even in the house when the weather is bad. Gets out tons of energy; plus, it doesn't have to be perfect for them to have a BLAST! Parkour guys do all the SUPERHERO moves. Jumping off walls, running up them, swinging off telephone poles, etc. Plus as a mom of boys, these parkour guys have great tips about how to land to reduce impact on the kids bodies and keep from breaking legs and arms. 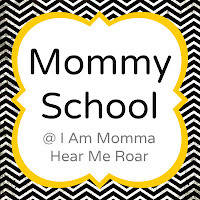 Has been really great info. Have fun! Even my big ones would love, much safer than the laundry basket they've been caught trying. I'm gonna try the crib mattress though.